Cookwell & Company* is an Austin-based company, but one of their owners lives in Dallas so I am counting this one because how can you not love BACON!? I've used this stuff on burgers, in meatloaf, slathered over cream cheese as a dip… it's uses are endlessly delicious. The website states, "This ain't your grandma's jam.It's not for spreading on scones at tea parties. No, this is grandpa's jam. Packed full of one of the greatest foods on earth...bacon. So while grandma is filling jars with fruity goodness, grandpa is slathering his bacon jam on juicy burgers, potatoes and roasted veggies. With a little bit of sweet and tangy, this hearty bacon jam...is better than good!" Available online at http://bit.ly/199Zd5q and at select H-E-B and Central Market stores. Buying a cooking class from Chef Tre Wilcox isn't giving someone a gift. It's giving them an experience. In October of 2012 Wilcox hosted his first TRE Cooking Concepts course. (The acronym stands for Technique Recipe Execution). These classes were created to give discerning food lovers the opportunity to learn the importance of culinary techniques and execution from his very kitchen. Limited to six seats per class, guests enjoy an intimate culinary experience straight from the personal kitchen of Wilcox - former Executive Chef of Village Marquee Grill and two-time alum of Bravo TV's Top Chef (Season 3 and 8). Now, this is not a traditional cooking class. YOU don't actually cook anything. You meet Wilcox at his Downtown loft and sit at his bar while he prepares and serves you a four-course meal, providing instruction and tips and tricks along the way. Everyone in my class was clearly a Top Chef fan and Wilcox did not disappoint as he regaled stories from his seasons, dishing gossip about other contestants and sharing behind-the-scenes secrets. Classes are $195 per person. To see date options and purchase classes, visit http://bit.ly/IV6XxI. I am not a big fan of hot sauces but my husband always has some bottle of red sauce he is shaking on everything. 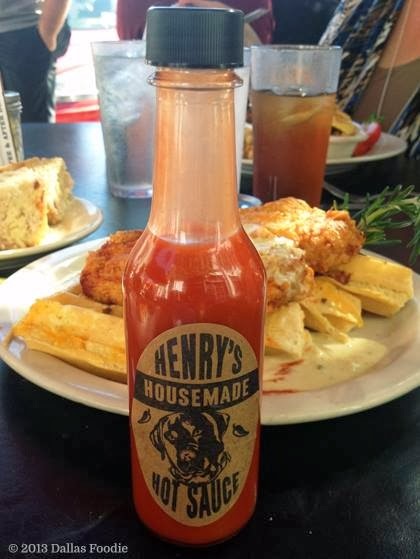 I have become a convert thanks to Henry's Housemade Hot Sauce from Bread Winners*. Dallas Foodie also included this product in her recent Gift Guide saying, "I've enjoyed it on chicken, waffles, eggs, and Bloody Marys. I have a low heat tolerance and a foodie friend with a high heat tolerance tried it with me, and we agreed this has a mild heat that didn't leave us reaching for a glass of water." 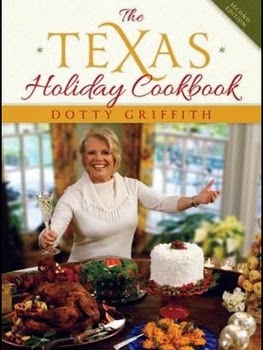 When first published, The Texas Holiday Cookbook from Dotty Griffith drew rave reviews and gained a national following. In this new second edition, the former Dallas Morning News food editor provides truly Texan recipes like Margarita Balls and Really Whomped-Up Mashed Potatoes. Recipes have been updated for contemporary tastes, products, equipment, techniques, and lifestyle concerns such as nutrition profiles. New chapters and materials include: superstar Texas chefs’ holiday traditions and recipes; food gift ideas for Thanksgiving, Hanukkah, Christmas and New Year's; Texas wines and spirits for holiday celebrations; and Texas tricks to make holiday cooking tastier, quicker, and easier such as combining homemade with takeout, using convenience products, and sharing the workload with guests. Available online at Amazon or at Barnes & Noble locations. Scardello Artisan Cheese is offering special Gift Boxes for the 2013 holiday season. 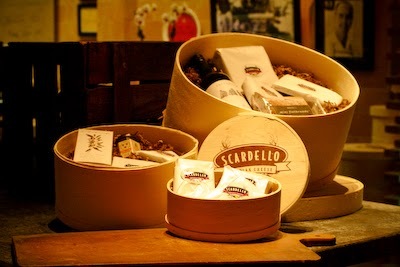 With 10 unique and delicious gift boxes to choose from, Scardello has something for every cheese-lover on your list! You can also customize your own gift — just pick the box size, type of cheese and fill it up! Prices range from $45-$95 for customized gift boxes. You can also add a bottle of wine for just $20 to a medium or large box. Scardello also has informative cheese books from some of the best cheese minds around, cutting boards of all shapes and sizes, loads of cheese knives and the ever-popular Tower of Salt – seven hand-gathered sea salts wrapped up and tied with a bow! Scardello Artisan Cheese is located at 3511 Oak Lawn Avenue, Dallas, Texas 75219. The gift boxes can be purchased in store, over the phone or at scardellocheese.com. Shipping is available on all gift boxes. *Cookwell & Company and Bread Winners are clients of Gangway Advertising. Aren't I lucky to get to work with such amazing brands! ?